Looking for a way to save money on travel? Flying space-available (Space-A) on a military flight is a great way to stretch your income. You can fly to and from U.S. military bases all over the world while spending next to nothing on airfare. Of course, it’s not as simple as calling a military passenger terminal and “booking” a flight. Flying Space-A on military aircraft is very different from commercial air travel. But it’s well worth learning how Space-A travel works so that you can take advantage of this incredible privilege available to eligible members of the military community. 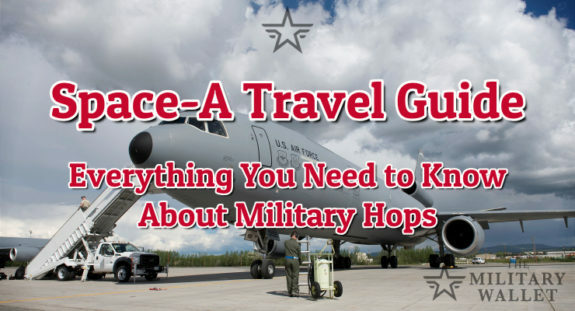 What Are Space-A Flights (AKA, Military Hops)? How Does Space-A Travel Work? The Pros: What are the advantages of flying Space-A? The Cons: What are the disadvantages of Space-A? When Should You Use Space-A? In these circumstances, the military mission is always the priority, and the Space-A passengers are along for the ride. When flying Space-A, you might be in a cargo plane, a fuel tanker, or a commercial charter plane. But the process works the same way for all missions. Space-A travelers are divided into priority groups known as Categories or “Cats” based on their duty status and the reason for travel. Lower numbered categories have higher priority for seats. It is important to know your category when planning your Space-A travel because your category determines when you can sign up, what paperwork you need, and where you are eligible to fly. Table 3 in Section 4.11 of DOD Instruction 4515.13 has more detail on eligibility by category and approved geographical travel segments. Flying Space-A is a process, and the better you understand it, the greater your chances of having a successful trip. The first step is figuring out which bases have regular flights to your destination. You can start by looking at this list of worldwide locations that may have Space-A opportunities. Profiles of some terminals include information about typical flight destinations. As discussed in the next step, you will learn more about where the various air terminals fly most frequently when you begin following their Space-A flight schedules. In some cases, there are many possible routes you can take to your destination. For example, if you are on the East Coast and want to travel to Spain, you can fly from one of several bases that have regular missions to Naval Station Rota. If you’re coming from another part of the U.S., you will likely have to take multiple hops to get to Spain (e.g. JB Lewis-McChord to JB Charleston, and then JB Charleston to Rota). The Space-A Travelers Facebook group is a great resource if you’re having trouble piecing together a flight plan to your destination. Use the group to ask questions and search for information about flying to and from specific locations. Keep in mind that you may need to combine Space-A travel with other transportation. If you don’t live near a base with regular Space-A flights, you will have to drive or fly commercial to one of the active Space-A hubs. Similarly, you might hop a flight to a base overseas, and then take a train or local airline to your final destination. Most military passenger terminals maintain a Facebook page on which they publish their flight schedules for the upcoming 72 hours. The schedules list the destinations, anticipated number of Space-A seats, and the “Roll Call” time, which is the time at which passenger terminal staff announce the names of passengers who have been selected for the flight. Terminals that maintain a Facebook page also publish information about recently-departed flights, including the number of Space-A seats released and the number of Space-A passengers who were competing for the flight. Use all of this information to monitor flights out of your target passenger terminals. Over the course of several weeks or months, you will see patterns in where and how often they have missions. Note: The Air Mobility Command (AMC) website has links to all terminals’ social media pages. If a terminal does not have a Facebook page, you can obtain Space-A flight information by calling the terminal directly. When you have a destination in mind, sign up to fly from any and all terminals from which you might travel. Signing up is free and takes only a few minutes. In the example in Step 1 above, if you were traveling to Spain, you would sign up at every passenger terminal that has regular missions to Rota. The AMC website has instructions for signup, including a list of all information required. You can submit your signup through their website, via e-mail, in person at the terminal, or using the TakeAHop app (the app costs $6.99). E-mail and the TakeAHop app are the easiest ways to sign up with multiple terminals at once. Sign up as far in advance of your travel date as possible, in accordance with your category. When competing for seats, priority within a category is determined by signup date and time, so the longer you’ve been on the list, the better. At most terminals, a signup is good for up to 60 days. Active duty cannot sign up for Space-A travel until they are on leave. However, being in Cat 3 means that you have priority over travelers in categories 4, 5 and 6, no matter how far in advance those passengers signed up. Within 24 hours of your target flight, go to the terminal in person and notify the staff that you are competing for the flight. Bring your military ID, passport (if traveling to/from a foreign country), and any required travel authorizations, such as your leave form if you are active duty, EML orders, or the memo from your sponsor’s command if you are an unaccompanied dependent. You should also bring a copy of your signup e-mail in case the terminal does not have a record of your signup. Most terminals will accept your e-mail as proof of your signup date and time. You must mark yourself present before Roll Call starts, but you can do so anytime within 24 hours. One or two hours in advance is generally enough, but be sure that you are continually monitoring the passenger terminal’s Facebook slides in case they unexpectedly change the Roll Call time. It’s also a good idea to call the terminal directly to confirm that Roll Call has not changed; sometimes the terminal staff is too busy to update their Facebook page promptly. When Roll Call begins, terminal staff announce how many Space-A seats are available for the flight and read the names of the passengers selected. They start with the passengers in the lowest-numbered (highest priority) category and work their way down the list. If they call your name, go to the desk and confirm that you and any dependents traveling with you are present. Bring your required paperwork along with your and your dependents’ military IDs. ID cards are required for all passengers over the age of 10. When traveling with children younger than 10 who do not have an ID card, bring their passport or a MilConnect printout that shows their DOD ID number. If they don’t call your name during Roll Call, you should stay in the terminal, at least until the flight boards. Sometimes, additional Space-A seats are released at the very last minute. Luggage check may begin immediately after Roll Call or several hours later. When it’s time to check bags, all travelers in your family and all of your luggage must be present. On most flights, each passenger can check two bags of up to 70 lbs each. You can also check car seats, which do not count towards your baggage allowance. Some smaller aircraft limit baggage to as little as 30 lbs per person. If you or any of your dependents cannot meet those requirements on the weight-restricted aircraft, you are not eligible for the flight. The AMC website has detailed information on baggage allowances. Some locations offer box lunches for a nominal cost ($10 or less), which usually include a sandwich, chips, cookie, and drink. You can request and pay for those meals when checking your luggage. Once you’ve checked your bags and have your boarding passes, you are “manifested” on the flight. The terminal staff will tell you the estimated boarding time. However, boarding times often change without notice, so stay in the terminal. When the passenger terminal announces boarding, all manifested passengers go through security. Military passenger terminals follow Transportation Security Administration regulations, so you have the same restrictions for carry-on items as on civilian planes. You sit in a secure area of the terminal until it’s time to board the plane. At most locations, a bus takes you to the aircraft, and you board the plane from the tarmac. If you are flying Space-A on a Patriot Express flight, your boarding pass will list your assigned seat. On other Space-A aircraft, you select your own seats on a first-come, first-served basis. With the exception of the Patriot Express, flights on military aircraft are no-frills. The crew provides earplugs, a water cooler, and sometimes chips or cookies, but any refreshments are self-service. Depending on the type of aircraft, there may be regular seats or web seating along the sides of the plane. If it’s the latter and there is space on the floor, the crew may allow you to lie down on a blanket or air mattress (if you brought one) after the aircraft reaches cruising altitude. Military aircraft are often very cold and loud, so dress in warm layers, and bring extra ear protection if you don’t want to wear the foam earplugs provided. As you might expect, there are advantages and disadvantages to flying military hops. The most obvious benefit of flying Space-A is that it can be free or very low-cost. Patriot Express flights have a small per-passenger tax ranging from about $4 to about $35, and some terminals offer meals for purchase, but those are the only direct costs associated with the flight. You can save thousands of dollars on airfare if you have multiple family members traveling, especially to/from OCONUS destinations. Another benefit of flying Space-A is access to base resources as soon as you land. You can stay overnight in base lodging, stock up on snacks at the commissary, or get discount tickets to local attractions through the Information, Tickets & Travel office. When traveling abroad, landing at a U.S. military base also gives you time to get your bearings before venturing out to explore a new country. While you may get conflicting views on this point, flying Space-A can be much more pleasant than flying commercial. Having the option to stretch out on the floor of a C-17 is a nice alternative to sitting in the cramped Economy section of a commercial carrier. In addition, if you’re traveling with small children, you will likely get more help and support from fellow passengers than you would on a civilian flight. Finally, Space-A is a fun adventure, especially for anyone who has never flown on a military aircraft. The #1 disadvantage is the uncertainty. In most cases, you won’t know until a maximum of 3 days in advance where a terminal’s missions are headed, and you can’t be sure you have a seat until the last minute. When flying Space-A, you must have patience and flexibility. Another disadvantage is that the most difficult times to get a seat may be the exact times you want to travel. Summer PCS season, the winter holidays, and, to a lesser degree, Spring Break, are extra competitive, particularly when flying to/from OCONUS locations. There may be indirect costs associated with flying Space-A, including lodging, transportation, and meals while waiting for a flight. If you have to wait for several days, those costs can add up quickly. Finally, some passengers find military aircraft uncomfortable. Cargo planes are cold and loud, and if you are unable to lie on the floor in an aircraft that has webbed seating, an overseas flight will feel pretty long. Of course, those are all issues that you can remedy with proper planning, but they are a consideration when deciding if you want to fly Space-A. Keeping those pros and cons in mind, Space-A is a great option if you have time and flexibility to wait for a flight, particularly during the “off seasons” of fall, late winter, and early spring. Also, the more passengers traveling with you, the greater the cost savings compared to flying commercial. Space-A is never a good option when you have to be somewhere by a particular time, whether it’s for a wedding, a graduation, or a cruise departure. You should also avoid flying Space-A – particularly to OCONUS destinations – during the busiest times noted above. Always have a have a backup plan, including enough money to pay for commercial airfare in case Space-A doesn’t work out. Don’t wait for the perfect flight. Hop any flight that moves you closer to your destination, especially when traveling between OCONUS and CONUS. Each time you fly Space-A, you will learn something new, whether from your own experience or through conversations with fellow travelers. In the meantime, keep learning as much as you can about how the process works. When you have a destination in mind, do your research so you know about the Space-A terminal’s lodging, transportation, and immigration procedures before you land. Finally, remember that Space-A is a privilege we share as members of the military community, and the mission takes priority 100% of the time. With that in mind, be sure to bring plenty of patience, a positive attitude, and a sense of adventure. KC-10 Extender Photo by Tech. Sgt. James Hodgman, US Air Force. Stephanie Montague is the founder of Poppin’ Smoke, a website designed to encourage members of the military community to use their military benefits for travel. Stephanie and her husband have been traveling the world since he retired from the Army in 2015. Through Poppin’ Smoke, Stephanie shares everything they learn about Space-A travel and using military benefits while abroad.